On Thursday, iPhone and iPad software publisher Chillingo previewed three action-packed games to selected members of the press. E3 may be known for over-the-top presentations by the big console companies, but iPhone and iPad developers also take the time to unveil their wares at the show. It’s due to the increased popularity of the iPhone and Android markets that traditional console companies like Nintendo and Sony feel the need to respond and fight back against what they perceive to be a threat. Chillingo embodies that threat to the traditional gaming powers: they’re young, they’re small, and they have built a reputation for publishing quality games developed by smaller development companies. 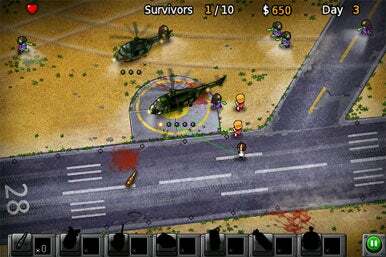 Developed by Angry Mob Games, Predators is an officially licensed game based on the new Robert Rodriguez sci-fi flick. In Predators, you play as a young predator stalking his prey on a “game preserve” on an alien world. In order to gain full membership in your clan, you must defeat eight human warriors in combat. Predators will be available for both the iPhone and iPad, featuring 24 missions and many of the iconic weapons from the Predator franchise, including shoulder cannons, wrist blades, spears, net guns, stealth generators, and thermal vision. The game is effectively a 3D brawler with some stealth elements and a whole lot of gore thrown in. You can rip your opponents in half and watch the blood fly as you use your wolverine-like claws. Though the game’s press release has it rated as ages 9-plus, I don’t think parents will want their kids playing this anytime soon. This is a mature game where the mission is to gruesomely kill a variety of well armed enemies until you reach the eight characters from the movie, which you then must also gruesomely kill. The third-person perspective is fine for the game, and the graphics in the demonstration I saw were pretty impressive as far as iPhone action games go. However, the limited size of the screen means that your enemies can often see you before you can see them, thereby eliminating any element of surprise. The Chillingo reps assure me that the game build I played was early and the pace was too slow for what they wanted, but my issue wasn’t with the pacing, but with the view. You need to be able to stalk your prey, not stumble into them on these tiny maps. The game is still weeks away from launching, so let’s hope the developers figure out a better balance of stealth and action. The other two games I saw were zombie themed, but could not have been more different. The first game, Zombie Escape, was developed by Viqua Games and is essentially a line drawing game. You must lead people to the helicopters while ensuring they avoid the bloodthirsty undead. It’s a cute twist on a new genre and has some nifty features to it. In addition to leading your survivors to their evac choppers, you can unleash bombs and other attacks on the undead to help clear the way. Zombie Escape offers 28 days (ha!) to survive and various locations to evacuate. Weapons include air strikes, sniper rifles, bombs, meat (to lure the zombies away) and sleeping gas. You can unlock achievements and see global leaderboards as well. Look for this title in the coming month. Zombie Wonderland, in contrast, is an interesting combination of survival horror and time management. The iPhone version is currently available on the App Store for $1, but an iPad version is in the works as well. 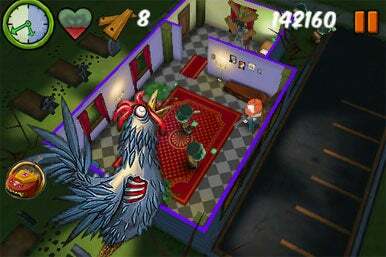 The game takes place in the town of Niceville, where zombies keep invading their homes. You play as Chuck, the zombie “cleaner,” who must defend each entryway of a home while keeping on top of your chores and cleanup duties. Not all zombies behave the same way, so you have to prioritize who you shoot, what doors you barricade, and when you clean up zombie guts. Throughout gameplay, you can unlock more menacing weapons and cleaning supplies. Zombie Wonderland plays like a time management game, but thanks to a real easy tap interface, it’s also a pretty efficient little survival horror game as well. The cartoonish graphics lend the game more to humor than horror, and there are some moments—like when putting a shotgun to a zombie grandma—that made me laugh. Developed by a one-man team at Xoobis, for $1 it’s definitely worth checking out. So far, only Zombie Wonderland is available on the App Store and has a price point. But look for the other titles on iTunes in the coming weeks. We’ll have reviews of the games when they become available, so keep checking the Macworld Game Room.